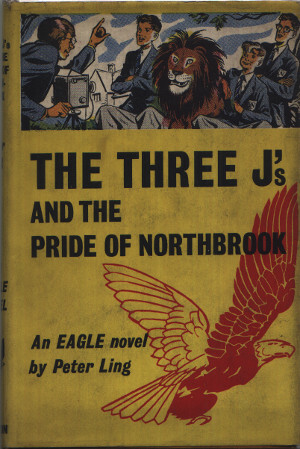 The Three J's and the Pride of Northbrook. When Woolily Willie, he mascot of Northbrook, appears sporting the colours of rival Oakfield, the Fourth Form swears immediate revenge. The feud is on. But it soon becomes clear that Northbrook shelters an informer, and all the evidence points in one direction - to the boy who is so secretive about his past and about his link with Oakfield. When the police have to take a hand and an innocent man's future is threatened, the 3 J's decide that in spite of The Raven's orders they must seek the truth - and walk right into the enemy camp to get it. Dimensions : 13.5cm x 20cm with 191 pages. Well - I think those stink bombs would have been a good idea - if I hadn't fallen downstairs while they were in my trouser pocket..." grumbled Jacko. Yorkshire? Him?. If he's from Yorkshire then I'm a Yorkshire pudding!" ... and adventure in Michael Prescott and Oakfield School both played prominent parts - and an adventure over which Oakfield lost a hundred pounds, Mr. Reed lost his trousers, and Woolly Willie lost a good deal more of his shaggy mane!" "Pooh!" he sniffed. "Whatever have you been plastering on your head? It's got a terrible whiff!" "Wonders will never cease!" John raised his eyebrows. "Master Eccles is in funds!" The battle of the Tuck Shop stores may not have been an engagement that will go down in the annals of military history, but for anyone who saw it, it will be an unforgettable memory. A few moments later, Jacko straightened up, wondering why six of the worst were always known as "six of the best!" It's a good job there's no moon tonight," said Copper. "We don't want any nosey-parker to spot us on the way...."
"Ooh - me nerves," he mumbled to himself. "I wonder what's going to happen to those poor kids - I really do...."
A great shout of laughter went up all round the Dining Hall, and the two schools settled down to their tea again; the threatened battle was over, and all was peace once more.